Today you should be looking at opportunities that are presenting themselves for you to expand your horizons. The Three of Wands says you’ve already made strides toward accomplishing important goals. And you’re probably also already starting to see the fruits of your labors. Whether this is related to a projects in the workplace or momentum you’ve gained in your personal relationships, you can take a moment to pat yourself on the back for a job well done. But it’s also time to look toward the future. The Three of Wands — like all Threes — acts as a bridge between the tension and uncertainty of the Twos and the structure and stability of the Fours. With that in mind you want to think about how far you’ve come as you plan your next move. The central figure in this card is a young woman looking out over the vast horizons before here. The night sky is alive with fireflies and stars. A crescent moon — waxing, which relates to growth and potential — shines down on her from above. Look at the three wands placed neatly behind her. They’re there within arms’ reach, but her focus is on what lies ahead. Her trusty companion sits by her side, and is equally immersed in the landscape before them. This is a good reminder that you didn’t get where you are today alone. Whether it’s been help, inspiration or just motivation, remember those who have been a part of your journey and deserve some recognition. The Three of Wands says you’ve still got a ways to go. But you can take pride in how far you’ve come. 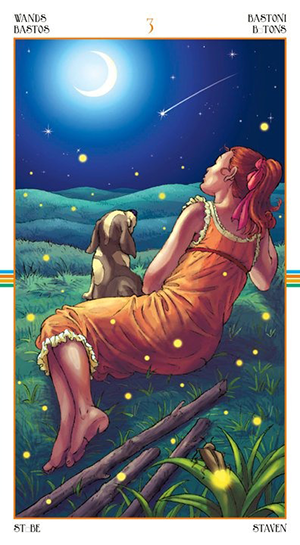 And like the girl in this card, you can thank your lucky stars for the rewards you’ve already been shown. Today’s tarotscope — the Three of Wands — is part of the Wheel of theYear Tarot series by Maria Caratti and Antonella Platano, published by Lo Scarabeo.